The Lavera Vegan Q10 Anti-Wrinkle Fabric Mask is an anti-aging treatment that deeply hydrates the skin. It protects the skin from free radicals and prevents it from cellular aging. Thanks to its formula based on natural coenzyme Q10, your wrinkles are visibly reduced and your complexion is unified. As you go, your skin regains its suppleness and radiance. 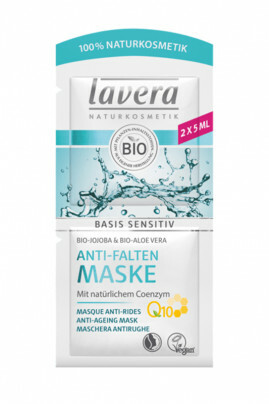 Lavera Vegan Q10 Anti-Wrinkle Fabric Mask gives you smooth, soft skin in one application. It is particularly intended for mature and demanding skin. Lavera Vegan Q10 Anti-Wrinkle Fabric Mask with anti-aging properties for rejuvenated skin! On cleansed skin, apply the mask avoiding the eye area and lips. Leave on for 10 to 15 minutes so that natural assets penetrate the best. Rinse the excess with lukewarm water or have it penetrate in circular motions on your face. Your complexion is dull and your skin needs a real boost? Leave the mask on all night. You can apply this wrinkle mask several times a week. This mask anti-wrinkle face mask is composed of natural active anti-aging!